Sell your art on demand with Woocommerce. 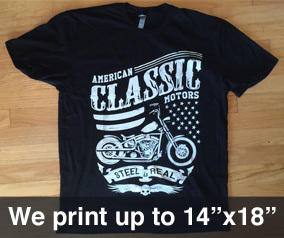 We print and ship orders under YOUR BRAND. Add the Print Aura Woocommerce app for instant print on demand fulfillment of t-shirts and more. The app is FREE and you only pay for orders when customers purchase your products. Our Woocommerce app has 100% t-shirt fulfillment integration. You just have to install the app, create products, and get sales and we take care of all the rest! Get setup in just a few minutes today with your Wordpress blog and start selling t-shirts. We feature tons of t-shirts styles for men, women, kids and print on other products including phone cases, posters, sunglasses, mugs, and more. 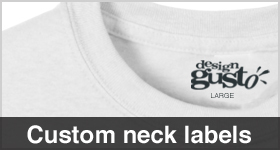 T-Shirts are printed direct garment methods using Kornit Avalanche machines. Once you have an account with Print Aura and have Wordpress and Woocommerce installed you can get setup setup in 5 minutes. Choose from 100+ different products that we offer and add products to your Shopify store. You can specify colors, prices, titles, descriptions, categories and more! When you get an order in Woocommerce with a Print Aura product the order is automatically sent to Print Aura. 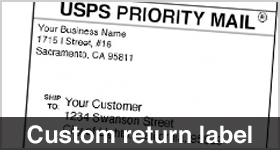 We will bill your account and then print/ship it under YOUR BRAND within 3-5 business days . 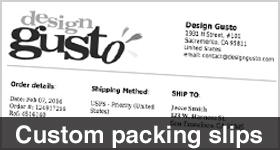 The package will be shipped with your business name on the return label and a custom packing slip featuring your logo.